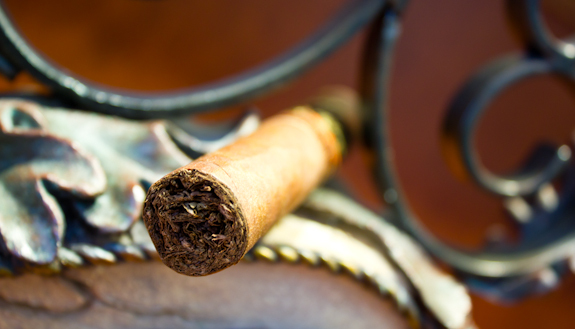 Today we’re visiting another cigar from the tobacco blending master, Pepin Garcia. This time it’s not from his son’s My Father Cigars brand, but rather from his own named brand. 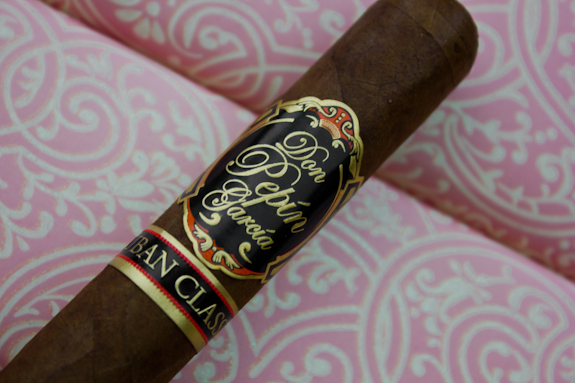 The full name of this cigar is the Don Pepin Garcia Cuban Classic, but sometimes you may find people calling it the Black Label. Now I have to mention that this cigar came from our good friend Lou Bozelli who had a great little “Cigar-B-Cue” last week. We all had a great time and he gifted me with a few awesome smokes. Thanks again Lou! Contrary to what you might expect, this cigar is not made at the amazing and famous My Father Cigars Factory in Esteli, Nicaragua. However, it’s production location is not too far away at the Tabacalera Cubanas S.A. factory, also in Esteli. 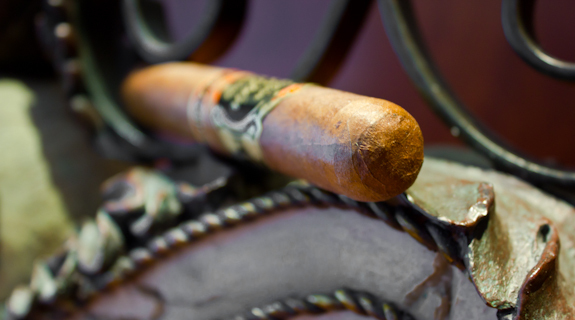 Now the actual name behind this cigar is El Rey de los Habanos, the company Don Pepin Garcia started in Miami(Little Havana) when he landed state-side. The headquarters is still located in there as well as a smaller El Rey de los Habanos factory . This blend was released be Don Pepin to the public in 2006. From what I’ve been able to gather, the various names of the original 7 vitolas in this line all correspond to important years in Don Pepin Garcia’s life. However, I wasn’t able to find the significant milestone behind the year 1979. It seems also that although there were 7 vitolas available at some point, there are only 5 easily available now. The band on this cigar has also changed slightly over time. As it stands now, there are two bands. The top band has a black background with a nicely scripted “Don Pepin Garcia” in the middle surrounded by some gold and red filigree designs. In an older band, the red and gold filigree was slightly different. Below that band is another thinner black band that says “Cuban Classic” with a line of gold and red on the top and bottom. 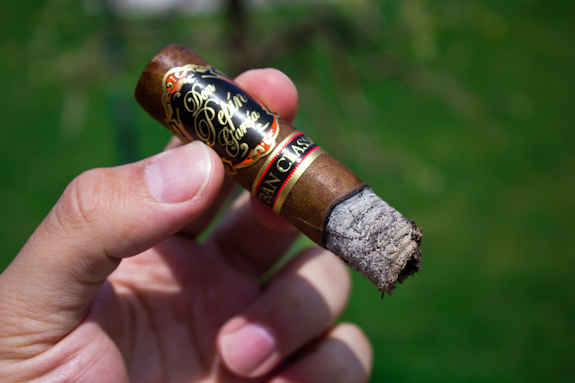 Now the Black Label is touted to be the strongest of the Don Pepin Garcia cigars. The other blends in this line are the Blue Label and the Series JJ (White Label). 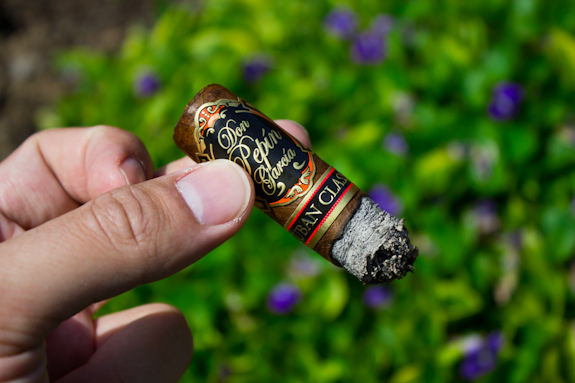 I’m going into this cigar with high expectations as I’ve come to know from many different Pepin Garcia blends. 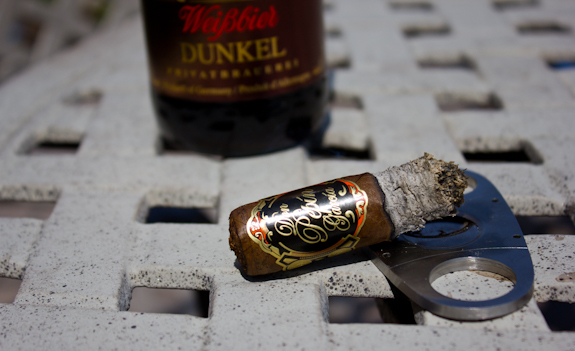 It’s a gorgeous day as I sit outside to spark up this cigar, so let’s see how it fares. •	Each ash was easily hitting the 1 inch mark but since I didn’t have a proper ashtray with me today I had to tap them off early. You’ll also notice the ashtray picture is missing today. I hadn’t had too many of these before so I didn’t have many notes to fall back on but what I did find was mostly good. 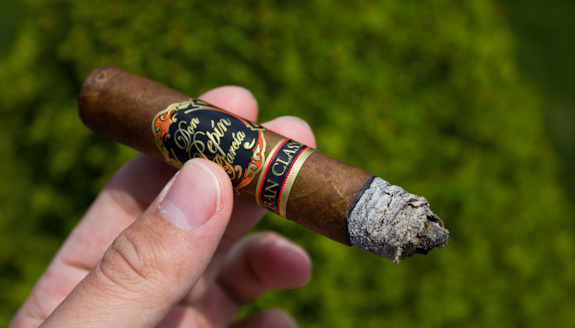 And judging by my experience today, I’d say the don Pepin Garcia Cuban Classic is another winner from this renowned blending master. I was happy to see another blend that didn’t have the pepper kick at the start but still had tons of flavors that were enjoyable. I’m not sure I would go for a Churchill vitola in this blend but as a Robusto it was excellent and I would definitely buy more. The flavors were enjoyable even if not overly complex and it burned amazingly even. My only real complaint was a little too much glue on the band that ended up cracking the wrapper a bit, not a huge deal. This might also have been because I tried sliding the wrapper rather than taking it right off. These are definitely worth trying if you haven’t had one before and definitely worth buying again if you have. I know it is a staple in many people’s humidors and it’s easy to see why. One thing to watch out for is the price, I saw a huge variety of prices and these can be easily had for under $5 if you look hard enough, and at under $5 this is a great value cigar! This isn’t my first review with Erdinger’s Weissbräu Weißbier Dunkel and it definitely won’t be my last. 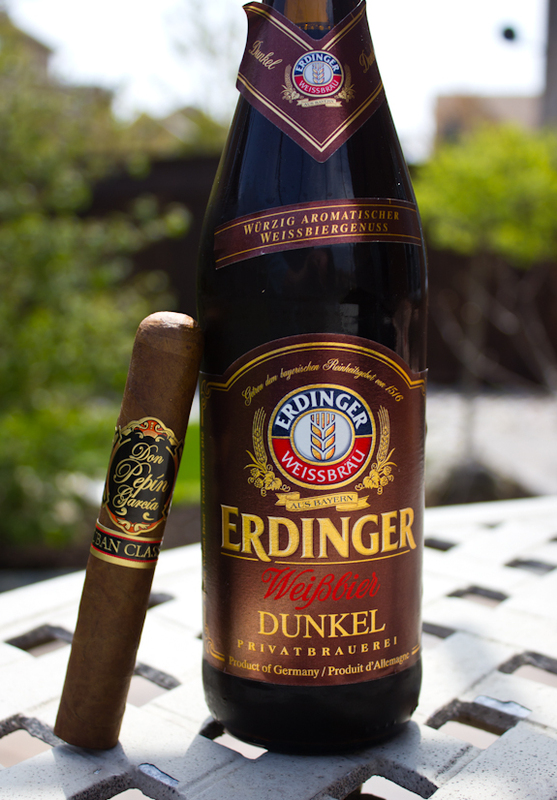 This dark ale from Erdinger’s German brewery is a classic and tasty brew that I’d say falls somewhere in the middle of a dark ale and a porter. The unique consistency probably comes from the fact that this is a dark WHEAT beer, so it’s a little different from the rest. It’s not quite as light as a dark ale and not quite as heavy as a porter. It’s got an awesome array of roasted malt, dark berries, coffee and a tiny bit of bitterness to round out a very flavorful brew. 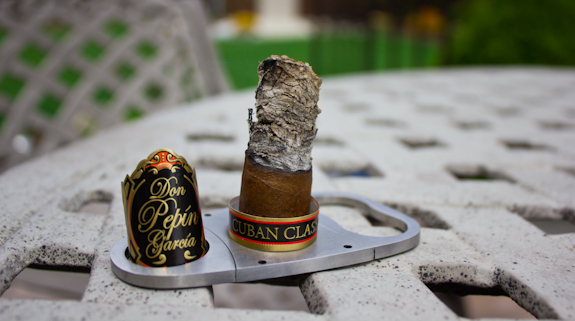 It makes a great pairing with the Don Pepin Garcia Cuban Classic as well as many other cigars. Other suggested pairings here would include a dark roasted coffee, a stout or porter, and of course, some tawny Porto! “Sons”? Last I heard, DP had one son, Jamie, and one daughter, Jany. I could very easily be wrong on that. Just the last, best info. I’ve got, and I’ve met DP and spoken with him about 6-7 times (w/the aid of Jaime, IIRC…my Spanish isn’t great, and DP didn’t appear to speak much English last time we met up, which was about 2 years ago. BTW, 1st time I met DP was at his tiny shop on Calle Ocho. Iasked if he even knew how to make a bad cigar. IIRC, this was 2003. He picked up one of this same line of cigar in a small vitola, clipped the head with his thumbnail, torched it and handed it to me. Very pleasant man, pleasant chat. In the same trip through Little Havana, I stumbled across another tiny shop by the name of El Titan de Bronze, kitty-corner to El Credito, which was a couple doors down the street from DP’s place. Picked up a few good cigars at ETdB, which almost no one outside of Miami seemed to have heard of back then (they are now making Padilla’s new Miami, among other sticks), and later ended up buying four boxes of my favorite of their blends, the Sungrown Redemption churchills. Love ’em. Won’t bore you with other DP stories, but one last quick one…after Cigarfest in Bethlehem, PA in 2008, I stopped at Holt’s in Philly on my way out of town. Had picked up several singles I had been wanting to try. Turned around, and standing behind me was DP, just three days after I had last seen him at Cigarfest. Small world. But I digress…badly. 🙂 Oh…still have a Tatuaje Miami Cojonu 2003 from the first DP contact, saving it for a special occasion, even though I have several cigars that cost more $. Good catch pacman! I actually forgot the apostrophe, meant to say “son’s”. Only Janny and Jaime as far as I know for his kids 😉 Very cool that you had a chance to meet him and Jaime! and more than once to boot! I had the 2003 not long ago, was an interesting smoke! Let us know what you think when you have a chance to light it up! My pleasure. Will bookmark and try to remember to follow up. Nice review Daniel. This is one of my old favorites. I’m surprised you didn’t get more black pepper as these are famous for it — maybe yours had some age on it. I had one of the “new” repackaged ones recently (with the band on the foot) and it seemed tamer than the earlier ones. BTW, sad to see that our forum is now gone. I agree with Dave, all the ones I have had carry TONS of pepper. Never thought about aging this one. I can honestly say there was almost no pepper on this one but I do remember getting it on some other of the Cuban Classic’s I had. It’s possible it had some age, we’ll have to find out from Lou when he picked up this box of them. If this is how they age then they are definitely worth keeping around for awhile! I will have to pick up a few of these. Any preference regarding the vitola? Although I haven’t had the Cuban Classic, I am a fan of the Blue Label, especially with a bit of age on them. The Blue Label is tasty too but I think this one might have had a slight edge on it. I’ve had a couple of the larger vitolas and I think the smaller ones suited this blend better, robusto being a tasty medium sized option. Hmm, I’m going to have to figure out a way to get some WA state beers and/or wines to you. Hey Daniel, I loved this smoke, which is a good thing since I bought a box!! I must say the first time I tried one, given to me from our cigar friend Jarvis D, it blasted out of the gates with pepper and I just remember that, I don’t even have to go and look back at my notes. I was really surprised when I tried these out of the box and didn’t get the pepper blast that I was expecting. Like you said though, all in all a very good smoke to be thoroughly enjoyed. I chose the robusto size because it got the highest rating from the popular writers and now you 2nd it, that makes it official. haha Lou, glad to see you up and at it again! My only guess is that this box was sitting at the shop or in a warehouse for awhile, maybe it had some extra age. I’m guessing there’s no date on the bottom of the box? It was definitely tasty though so thanks for hooking me up! If you haven’t tried to Blue Label yet, keep your eyes open for it. 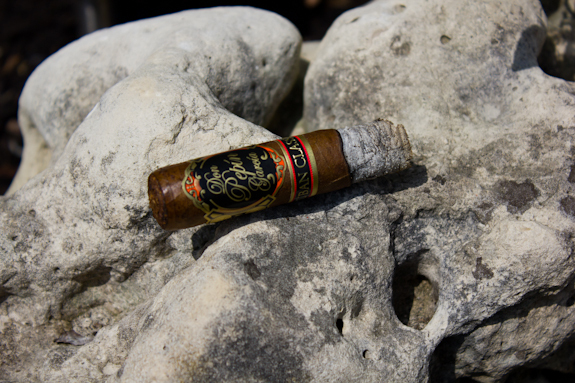 another great DPG cigar.